Raised garden beds can be a beautiful and practical addition to your yard, and at Copper Creek Landscaping, we love incorporating them into landscape designs. While raised beds have certainly seen a surge in popularity over the last few years (they’re even at the White House now! ), the technology has been traced back at least 2300 years to ancient South American cultures. Why has it stuck around so long? Simply put, raised beds make it easy to grow great plants. Whether for food production or purely for decoration, raised beds offer simple solutions to many garden problems. Experienced gardeners will know that achieving the right levels of nitrogen (N), phosphorus (P), and potassium (K) is an important step in growing healthy plants. Beyond NPK levels, however, is the actual soil composition. The Inland Northwest has an incredible diversity of soil types due to its varied geologic history. If you’re near downtown Spokane or on the South Hill, expect to find a lot of rocks–hard to deal with any day of the week, and especially bad for growing root vegetables. Head up north to Nine Mile Falls to find plenty of sand, which presents its own set of problems. But gardening in raised beds allows you to bypass whatever problems your existing soil might have. You can start by importing entirely new soil and easily add amendments like fertilizer and compost to help your plants thrive. Another benefit to raised beds is the opportunity to better control weeds in your garden. Any time you disturb soil, you’re giving buried weed seeds and rhizomes the chance to sprout. Importing a quality garden soil gives you a fresh start. Installing weed barrier in the bottom of your raised bed before bringing in soil will further deter weeds and tree roots in your existing soil from making an appearance in your new bed. For root systems to grow and plants to get the nutrients they need, good soil structure is critical. Foot traffic compacts your soil, gradually collapsing all the tiny subterranean air pockets roots take advantage of. Raised beds keep all the foot traffic away from the growing area, allowing your plants to develop strong, robust roots. As a bonus, healthy soil structure also promotes good drainage, keeping your plants from getting waterlogged. The many microclimates between Spokane and Coeur D’Alene mean that someone in Cheney will have a slightly different growing season than someone in Five Mile or Liberty Lake. And since earth is very good at maintaining a stable temperature, it can take more than a few sunny spring days to warm the soil after winter frost. Raised beds, however, are a different story, creating their own micro-microclimate. Without the continuous insulation you find below ground, raised beds become ready for planting earlier in the season than the surface soil outside the bed. This means extra time for your garden to grow–and more vegetables, herbs, and flowers for you to enjoy. Yard work is a classic cause of back pain, even for those who are otherwise spry. With raised garden beds, you essentially bring the ground closer to you, making it much easier to tend your garden without stressing your body. And for those with limited mobility, a tall raised bed with ample access around it can readily be cared for from a seated position. In addition to being physically easier to access, raised beds also have improved visual access. By elevating your garden, you can better monitor it for pests, disease, weed growth, and other problems. There are many plants that have desirable qualities but spread vigorously. While our Inland Northwest winters will take care of annual invaders, raised beds can be a great solution for perennials that might otherwise take over a garden, like mint, beebalm, or lily-of-the-valley. Weed barrier can again come in handy here, keeping aggressive roots from escaping their designated area just as it keeps unwelcome plants out. Convinced raised beds are right for you? 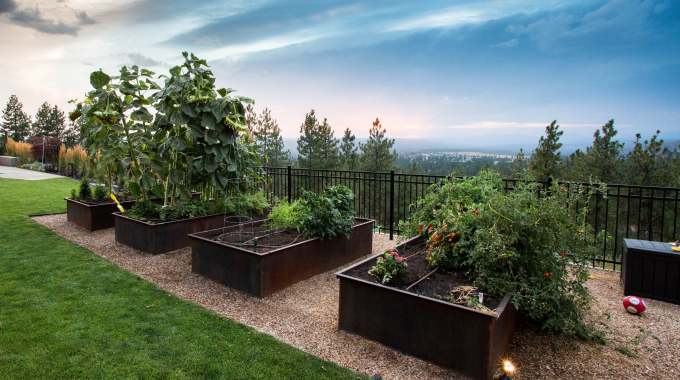 Contact us to talk about possibilities in your yard, and read our next post about building and installing raised beds in Spokane and North Idaho.